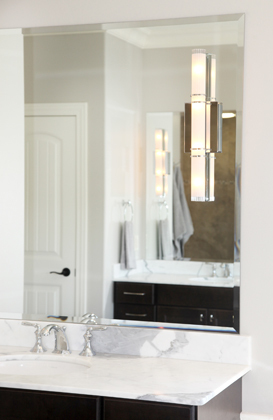 The best bathroom lighting starts with ambient light at the switch when you enter the bathroom. 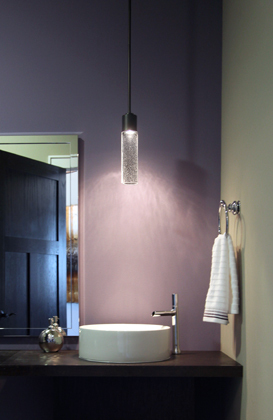 A ceiling light in a larger bath from Quoizel could add an element of style. In a Verona, Wisconsin, home we recently placed a gorgeous Kichler ceiling fixture with a drum shade in the master bathroom for instant sophistication. 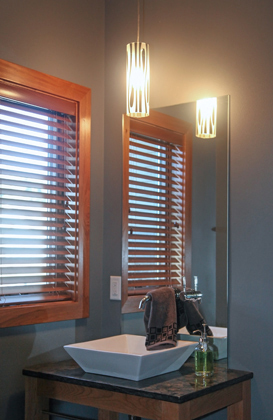 Adding recessed lighting in your bathroom helps eliminate shadows when at the mirror. Our Certified Lighting Specialists can help you choose the number of lights, the size fixtures, and then place them correctly to get the most out of this technique. Add a pair of vanity lights on either side of the mirror to eliminate shadows and make applying your makeup in the morning a whole lot easier. Placing the lights on each side of the mirror 56-60” from the floor puts the light at a good level for most people. LED tape lighting under the vanity’s toe kick or up over the top of bathroom cabinets just under the ceiling adds both a decorative and functional element. It highlights a beautiful cabinet or floor, and it can become the best night-light ever. You never see the light source; it’s tucked out of sight, gently spilling light at the flip of a switch. ©2019 Madison Lighting | All rights reserved.